Glaciers have relatively simple requirements to be viable: snow accumulation must exceed ablation. Snow accumulation occurs primarily as meteoric snowfall (derived from atmospheric precipitation), but snow can also accumulate at a site through wind deposition or avalanch-ing. Ablation refers to the loss of snow and ice through melting, sublimation, wind erosion, and calving, a process whereby slabs of ice at the glacier margin mechanically fracture and detach from the main ice mass. This is an effective ablation mechanism for glaciers and ice sheets that are in contact with the ocean, where iceberg calving removes large amounts of ice. Most melting occurs at the glacier surface—the ice-atmosphere interface—but there is also melting internally (englacially), at the glacier bed (subglacially), and on vertical ice cliffs at the glacier margin, particularly where glaciers reach the sea and a large area of ice can be in contact with water. Melting only leads to ablation in the case where meltwater runs off and is removed from the system; some surface meltwater in the upper regions of glaciers and ice sheets percolates into the snowpack or ponds at the surface, where it can refreeze. where Ac and Ab denote accumulation and ablation. B represents the rate of change in mass or volume of an ice body (a glacier or ice sheet), with units kilograms per year or cubic meters per year. It is also common to see mass balance described at a point on the glacier, or averaged over a glacier surface. Strictly speaking, this is the surface mass balance, Bs, which includes snow accumulation and melt but neglects basal and internal accumulation and ablation, as well as mass loss associated with calving. For most mountain glaciers, surface mass balance dominates total glacier mass balance, so Bs . B. Here, acs and abs refer to the local snow accumulation and ablation (primarily melt) at the glacier surface, with units kilograms per square meter per year or meters water equivalent per year (m w.e. yr-1). This is traditionally measured in glacier mass balance programs through stake and snowpit data. Snow density measurements are required to convert changes in snow-surface height to changes in mass. Averaged over the area of a glacier, this gives the mean specific surface mass balance, bs = BJA, for glacier area A. This is a useful measure of the average rate of thinning or thickening of the ice mass. In the literature this is often referred to as the net mass balance, bn, but it is only a measure of surface mass balance, not the total glacier mass balance. Figure 6.2. Schematic of a valley glacier, indicating the accumulation and ablation areas and the end-of-summer snowline, generally called the equilibrium line altitude (ELA). bs refers to the annual surface mass balance (accumulation - ablation). glacier, known as the ablation area (figure 6.2), is characterized by bare ice at the end of the melt season. Figure 6.1c provides a good example. Above this lies the accumulation area. The line separating the two is called the equilibrium line altitude (ELA), although this terminology is misleading. It is really the end-of-summer snowline, the elevation at which snow accumulation balances ablation in a given year, and it does not speak to the state of equilibrium of a particular glacier. For a given glacier, however, there is a unique value of the end-of-summer snowline, ELA0, which corresponds with a net annual mass balance of zero. A glacier will evolve into a state of equilibrium if the condition ELA = ELA0 is sustained for many decades. Glacier mass balance processes differ in tropical, mid-latitude, and polar regions. It is not possible to give a comprehensive account here, but it is a reasonable generalization to say that the mass balance of most mountain glaciers is governed by the surface mass balance (snowfall vs. surface melt), whereas other forms of ablation can be dominant in polar regions. Surface melting accounts for about 50% of the annual ablation in Greenland. Calving of icebergs to the ocean—"dynamical discharge"—is also important in Greenland, where it accounts for 40% to 50% of Greenland's annual mass loss. The remaining ice loss is associated with melting at the ice-ocean interface. Almost all of the ablation in Antarctica occurs through calving of icebergs at marine margins and basal melting in ice shelves and floating ice tongues. West Antarctica has major ice shelves in the Ross Sea and Weddell Sea (figure 6.1d), as well as active floating glacier outlets in the Amundsen Sea, making the WAIS exceptionally sensitive to marine influences. Because most of the world's glaciers have been out of equilibrium since the peak of the Little Ice Age in the late 1800s, it is now common to find relict glacial ice in places where the climate once supported glacier growth, but it has now become too warm. In these cases, glacier ice is no longer nourished through net snow accumulation or ice transport. This anomalous ice is slowly melting away, but it can remain on the landscape for decades or centuries while this occurs, particularly if it is insulated by a thick debris cover. There is no simple "threshold temperature" for a glacier to be viable. A mean annual temperature below 0°C is not a necessary or sufficient condition for glacier ice to exist. Valley and outlet glaciers that are in contact with the ocean, known as tidewater glaciers, are vivid examples of this. Because ice flow delivers ice to low elevations, glaciers can extend to sea level environments where mean annual temperatures are several degrees above 0°C. Although most glaciers do not reach the ocean, this feature is intrinsic to mountain glaciers; glacier ice in the ablation area can extend to relatively mild environments, particularly where there is ample snowfall. It is common to distinguish between maritime glaciers, which live in mild, wet climates, and continental glaciers, characterized by cool, dry conditions and low mass turnover. Interannual variability in glacier mass balance is sensitive to both annual precipitation and melt-season temperature, but the latter is the stronger control in most settings, particularly for continental glaciers. For instance, in the Canadian Rockies it requires an increase in snow accumulation of about 70% to offset a warming of 1°C. The climatic sensitivity of glaciers differs in maritime environments such as New Zealand, Svalbard, and Norway, where snow accumulation increases of 20% to 30% are needed to offset a warming of 1°C. Fluctuations in mountain glaciers are not perfectly synchronous in different regions, due to differing regional patterns of precipitation and temperature variability. As an example, increases in precipitation in northwestern Europe during the positive phase of the North Atlantic Oscillation (NAO) deliver extra snowfall to coastal Norway, promoting a more positive mass balance. This is usually accompanied by reduced moisture delivery to southern Europe. As another example from western North America, El Nino-Southern Oscillation (ENSO) causes opposite mass balance anomalies in mid-latitudes (i.e., the Cascade Range and Coast Ranges of Washington State and British columbia) and the subpolar latitudes of coastal Alaska. There are also local-scale (i.e. individual glacier) differences within a region due to the specific topographic setting of a glacier, the way in which this influences local climate conditions (e.g. 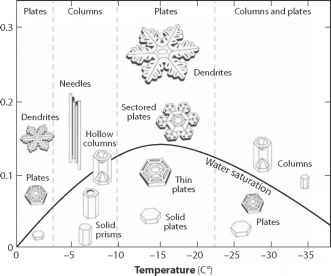 topographic shading, wind redistribution), and the dynamics of a particular ice mass. Bedrock and glacier hypsometry influence the extent of an ice mass that is affected by a shift in the ELA. This, the general mass balance regime, and the overall glacier size affect the response time of a glacier to a mass balance perturbation. Several concepts have been introduced to describe glacier response to climate change. Glacier reaction time refers to the time delay between a climatic forcing, such as years of positive or negative mass balance, and the ensuing response of the glacier terminus: ice-margin advance or retreat. In mountain glaciers, terminus positions react to mass balance perturbations that are maintained for several years, with typical time lags of about 10 years. This can be quantified by looking at the lagged correlation between annual time series of glacier length and surface mass balance. The concept is useful but it is poorly defined, because a given glacier may be in a state of advance or retreat at the time when a particular climate perturbation occurs, with a different reaction time expected in each case. A glacier's reaction to changes in temperature or precipitation may also vary, as these impact the glacier differently (i.e., in the ablation vs. accumulation area). The timescale for the dynamical propagation of these changes to the ice front depend on the nature of the climate perturbation, the glacier length, and the flow speed. Further, fluctuations of the terminus (glacier length) can also occur as a result of variability in ice dynamics. Glaciers may speed up in response to increases in meltwater or other environmental influences. Some glaciers undergo cycles of advance and retreat that are driven by internal dynamical cycles rather than climatic forcing (e.g., surging behavior or tidewater instabilities). This can lead to anomalous rates of either advance or retreat that are not synchronized with atmospheric forcing, so fluctuations in surge-type and tidewater glaciers need to be interpreted with care. These glaciers are still subject to long-term climatic control, but dynamical excursions are superimposed on climatic adjustments. Glacier response time offers an alternative measure. It is better defined than reaction time, but it is a theoretical construct. It is defined as the e-folding time2 for a glacier that is in equilibrium to come to a new state of equilibrium following a step perturbation to climate or mass balance. This is a more intrinsic measure of a given glacier's dynamical response time to climate forcing and should be repeatable or predicable for a given glacier geometry, flow characteristics, and mass balance regime. It is simple to calculate in a model but is difficult to measure or calculate from field observations, as real glaciers are rarely in a state of equilibrium. It nevertheless provides some insight into the timescale of glacier response to climate change, which turns out to be of the order several decades for most mountain glaciers. This means that most glaciers no longer have a strong memory of the Little Ice Age, but they are still responding to climate conditions from the second half of the 20th century. In contrast, large ice caps and ice sheets have response times of centuries to millennia. In Greenland and Antarctica, part of the present-day ice sheet evolution consists of "secular trends" related to the deglaciation from the last glacial maximum, which began about 20,000 years ago.